Jupiter, Venus and the moon will line up in an impressive triple play this weekend, and skywatchers won't even have to venture outside to see it. The three celestial bodies will be in close proximity to each other on the nights of Saturday and Sunday (Feb. 25 and 26), forming a skywatching treat known as a triple conjunction. The online Slooh Space Camera will webcast the action live, beginning at 9:30 p.m. EST both Saturday and Sunday (0230 GMT on Feb. 26 and 27). The crescent moon will appear closer to Venus on Saturday night, and nearer to Jupiter on Sunday night. People who watch on both evenings will gain an appreciation of just how much the moon moves through the sky over the course of 24 hours. 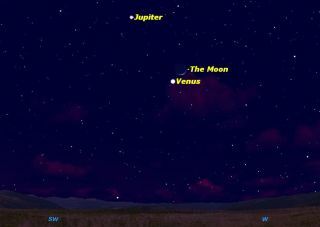 Jupiter and Venus are on the move from a skywatcher's perspective as well. The two planets are gradually coming closer together, and they'll pass each other in the night sky on March 13. This isn't the first time that the Slooh Space Camera has broadcast live views of cosmic events. Last year, the online skywatching service provided views of total lunar eclipses in June and December, and it partnered with Google to turn the Internet company's popular search engine doodle into a live stream of the June 15 lunar eclipse.